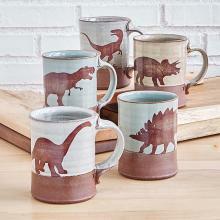 If you are looking for cool stuff to buy for the home for yourself or the people in your life, take a look at all the fun, cool, cute, unique, funny and useful stuff for the home our team of writers has found for you. Fairy gardens are delightful and they don't have to just be for outdoors. These fun Plant Pots for Succulents do most of the work for you and let you add some sweet tiny critters to your decor as well. CATable 2.0 is not an improvement on CATable 1.0, but an extension of the concept of sharing human work spaces with cats. Get Your Pain-Free Shark Bite Here! Have you ever been in one of those moods, most likely before your morning cuppa Joe, when you felt that you could just dare a shark to bite you? 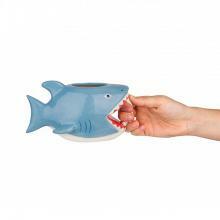 This funny Bite Me, Shark Mug will allow you to safely do just that. During these winter days the sun is something you want to have around as much as possible. 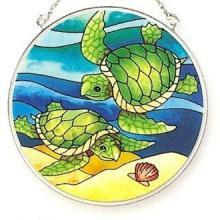 Catch a ray to two with this wonderful Sea Turtle Suncatcher. This cat's enjoying the natural fragrance of the wool's lanolin oil. 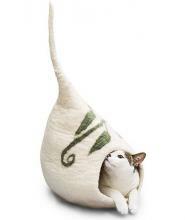 She's also enjoying the cozy, warm environment created by this lovely handmade Dew Drop Cat Cave. Most people seem to have that one door that needs to be propped open -- or closed. This awesomely cute Llama Butler Doorstop can do the job.